A fruit forward wine offering an assortment of candied cherries, raspberry, strawberry, blueberry and rhubarb. Next to the fruit is a pleasant earthy charters of forest floor and truffles mixed in with some cocoa. On the palette the wine is bright and fruit forward showing some nice dark cherry tones while keeping the earthy note in balance. The oak is well integrated, and the tannins are strong yet approachable. 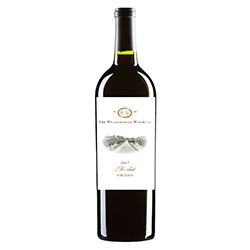 A full-bodied merlot that will age well and pair nicely with food.